This is a quick technical brief of my monitoring the Tunisian Legislative elections (between the period of October 23 – 27) in the Tozeur district in Southern Tunisia (Tozeur City, Nefta, Tameghza, Hazoua, Degache), which consisted of 123 polling stations in 48 polling centers, and 62,175 registered voters, of which 39177 voted. 1. The Independent High Electoral Commission (L’instance Supérieure Indépendante pour les Elections: ISIE) succeeded in organizing the first legislative (parliamentary) elections after the revolution, with the least possible errors and shortcomings. 2. The significant positive political observation is the fact of the acceptance of most parties (parties, movements, and independents) of the elections results. This stems not only from the confidence in the ISIE’s structure and practices, but also due to the consistence between the electoral results and the expectations. 3. Despite the delay in the formation of the ISIE, and despite this being its first electoral experience, the ISIE succeeded in selecting and effectively training a capable operations team (electoral office officials, both males and females). The majority of them possessed a high level of ethics and morality, discipline, neutrality, in addition to a high level of knowledge of what was required for the elections operations and what is requested of them. 4. The representatives of the ISIE succeeded in establishing their solid authority over all stakeholders engaged in the elections (security forces, polling officials, candidates, parties, blocs, and media). Therefore, the heads of polling stations and centers established and practiced a well-respected and almost exclusive authority over elections operations. 5. Gender balance at polling stations was fully considered and accounted for by the ISIE There were four staff members at each station, including the head of the center always equally divided on gender basis and women were also heads of centers.. We also observed that the hired officials were of highly educated backgrounds based on their behavior and not the data. 6. 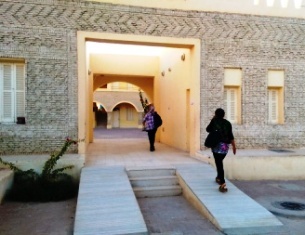 Most of the centers in the Tozeur district were equipped to serve people with special needs with facilities such as Braille ballots, a ramp for wheelchairs, and all stations were on the ground floor. 7. Polling stations did not segregate voters by gender; rather, they were distributed according to Identification Card numbers, which placed most of the young voters (both males and females) in some stations, and most of the elderly voters in others. On the one hand, this facilitated the process of providing the necessary support to the elderly as required, and on the other hand, it facilitated the surveying of voters according to age groups. 8. Instructions to the polling officials by ISIE were clear and strict with regard to providing support to voters, especially the elderly, without approaching the booths. The only thing that was not abiding the law was their necessary intervention to guide voters on how to use the ballots. 9. The Party representatives fully abide by the officials’ orders and avoided approaching voters, at least within the confines of the voting stations. 10. The electoral silence period was widely respected. Candidate lists respected the allocated space to hang posters and leaflets, and the ISIE proceeded to remove all posters from these spaces upon the beginning of the electoral silence period. 11. The electoral law stipulated the procedures for submitting and accepting the written objections of the candidate list representatives during the electoral process. The objecting candidates ‘representatives silently documented their objections on a special form that was provided to them by the head of the station. Upon the completion of the voting process, and prior to submitting the first sorting and counting report, the representatives submit their objection sheets. The station head directly responds to the objection in writing, and annexes a copy of the objection to the report that is sent to the ISIE. The head then signs the second copy of the objection and returns it to the representative. This measure was implemented to avoid the tensions and riots that could be caused by objections. 12. The ISIE relied widely on web and Facebook pages. It also placed a free hotline at the disposal of the voters, the polling officials and heads of stations to provide them with information about the locations of polling stations. An SMS line was established for citizens’ inquiries about the missing names of voters on the voter lists, and the ISIE already confirmed in the voter registration process. I tested the speed and efficiency of this process. 13. For increased transparency, the ISIE equipped closed sports halls in each district, in order to receive the ballot boxes from all polling stations, for centralized tabulation processes. 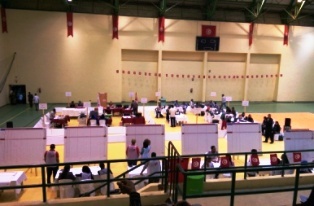 The ballot boxes were delivered to the relevant sports hall under the protection of the army. Meanwhile, the stands within the sports halls were prepared to receive candidate list and political parties’ representatives, local and international observers, and the media. Attendance was open and accessible to all, with no exception. 14. The number of appointed members in the committees opening the envelopes and dispatching them, as well as the appointed members of committees tabulating the votes from each district, was acceptable (30 officials). Required equipment, such as computers and other accessories were also sufficient. At the center, the process was managed by the head of ISIE, supported by the general coordinator of results. 15. The first error made by the ISIE was related to the tabulation of votes and it was logistical. The area of the hall was large, and the “layout” of the committees was as though they were players on a field. The observers, on the other hand, were only on the stands (they were mostly banned from accessing the operations area), which made effective surveillance difficult. Thus, we were not actually aware of any errors made in the reports or vote recounting, except for those declared by the ISIE itself, which reduced the transparency of the process. 16. The second error, which was not less crucial, was the complete absence of communication between the committees working on aggregating information (the committee heads and their aides) and the audience that was “watching” the process from the stands. For example, attempts made by the audience, specifically party representatives (specifically those from smaller parties), to appeal to the ISIE to respond to them and to state what is happening and what is upcoming, or to at least declare their process of work, but they all ended in failure. The objections continued until 2:00 am, when the entire “audience” decided to leave the hall in protest of being ignored. Also Representatives of the smaller parties objected to the successive broadcasts of unofficial results, to the point of accusing the ISIE of complicity with the troika authority, especially the Renaissance Movement (Ennahda Movement). Only then, around 3:30 am, the ISIE decided to open the scope of work to include everyone, with no exception. In the morning, the tense working environment that lasted throughout Monday was completely calm and transparent. 17. The audience stands (candidate list and party representatives, observers, and media outlets) were not provided with any equipment or electrical/electronic outlets (for example for cameras, phones, laptops, etc…) to facilitate their work. Guests were also not provided with food or drinks, not even those who were supposed to stay up and follow the vote tabulation process, which generally required 24 consecutive hours. 18. The respect towards the observers, and the facilitation of their work, as well as their welcoming by all parties, were truly remarkable during all stages of the process, within the stations and outside them, outside the centers and within the tabulating center, as well as at the security forces checkpoints on the streets. 19. The political parties’ acceptance (major parties) of the formation of the ISIE and their agreement on the scope of its work made the electoral process a successful one. Also, the agreement on the proportional system with closed lists certainly helped with the acceptance of all parties for the results. 20. Note for Lebanon: In addition to Paragraph 19, the use of pre-printed ballots did not constitute a problem for the Tunisian voters, contrary to what the Lebanese political class has always insisted on, and this is taking into consideration that the illiteracy level in Tunisia is slightly higher than that of Lebanon. Remark: These observations (both the positive and negative) are personal views and impressions formed by visiting polling stations in the southern governorate of Tozeur only. They are technical notes on the Elections Day, and not on the stages of the entire process. There have been repeated rumors related to buying votes, providing services, and media breaches. The ISIE may also find excessive spending that surpassed the set financial ceiling. However, these are not considered in the evaluation process of the Election Day, as we could not verify them as short term electoral observers (STO).